On Monday, the UN Human Rights Council (‘HRC’) expert panel met to discuss resolution 25/22 on ‘ensuring use of RPAS or armed drones in counter-terrorism and military operations in accordance with international law’. 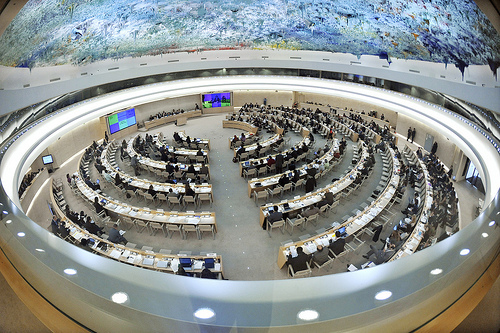 The objective of the meeting was to inform and engage Member States, and follow up on Special Rapporteur Ben Emmerson’s Reports to the HRC A/HRC/25/59 and A/68/389 and Special Rapporteur Christof Heyn’s Reports A/65/321 and A/68/382. ‘Resolution 25/22 is made all the more pertinent and timely as the frontiers of transnational counter-terrorism operations expand: increased use of armed drones underscores the need for greater consensus between States on how to apply the international laws that regulate lethal force. In our view, in the absence of consensus on this issue, States urgently need definitive recommendations (‘UN Guidance’) from a Special Procedures mandate-holder to address the questions posed at paragraph 71. Although the UK voted against resolution 25/22 and the panel meeting, representatives attended Monday’s meeting. This is an improvement. Discussion was limited however, focusing on the argument that the ‘HRC was not considered the appropriate forum to discuss weapons on a thematic basis’ rather than the substantive issues identified by the HRC and panel. This remains disappointing, and at odds with the HRC. The question is now: what happens next? The APPG Chairs and co-authors appear to share the view that Emmerson’s existing mandate is sufficient to cover issuing the UN Guidance sought. In other words, because the UK and other States have not responded to his report, the Special Rapporteur may provide the Guidance himself. If Emmerson agrees, he may now initiate a third report for this purpose. Several other matters discussed reflect the concerns of a coalition of human rights NGOs and academics. Flavia Pansieri, Deputy High Commissioner for Human Rights highlighted that the right to life placed stringent conditions on the use of lethal force. The use of armed drones impacts significantly on entire communities by creating an atmosphere of fear, notwithstanding precision claims. Christof Heyns reiterated that the law must not follow the drone; the drone must follow the law. In emphasising this, Heyns may have had in mind current debate concerning the uncertain legal bases for air strikes in Syria; and President Obama drawing from the controversial covert drone programme in Yemen and Somalia. Ben Emmerson emphasised that both international human rights and humanitarian legal regimes overlapped and applied. In human rights law, targeted killing was rarely lawful and had different connotations; one key question is whether a state of ‘armed conflict’ exists with particular regard to the intensity of the conflict. In any event, the single, greatest obstacle was lack of transparency, which prevented assessment of damage on civilians and hence accountability. Emmerson reminded States of their obligation under international human rights law to conduct impartial investigations into alleged violations. Ms Kebriaei flagged the right of remedy for victims and challenge of accountability for remote drone strikes. She described the HRC as a ‘springboard for action’. Shazhad Akbar informed the panel that not one of the 1,449 civilian victims identified in the May 2013 Peshawar High Court judgement had been compensated. The Panel reiterated the concerns of former Human Rights High Commissioner Navi Pillay about lack of transparency and accountability in the context of remote war; the need for States to outline their armed drone policies more clearly; and the requirement on States to take all measures to ensure any drone strike within armed conflict complies strictly with the principles of necessity, distinction and proportionality. It is hoped that members of parliament will consider the HRC expert advice given to States and have regard to international law and HRC advice that has not been complied with to date. As Chris Cole’s ‘Into the Fire’ argues, the long-term impact and security risks of another war must be assessed. The key issue for tomorrow is not whether ISIL should be stopped but, in all these circumstances, should the UK choose direct, remote air strikes in Iraq over humanitarian operations at this time. To enable informed debate, the Ministry of Defence should also disclose of alternative plans to deploy UK Reapers. APPG members have sought this information for some time, and tabled EDM 136 on application of the convention to redeployment of armed drones. In deciding whether or not to share these basics with parliament and the public, the Ministry may bear in mind the claims of Saeed Al Yousefi, supported by Reprieve and Deighton Pierce.